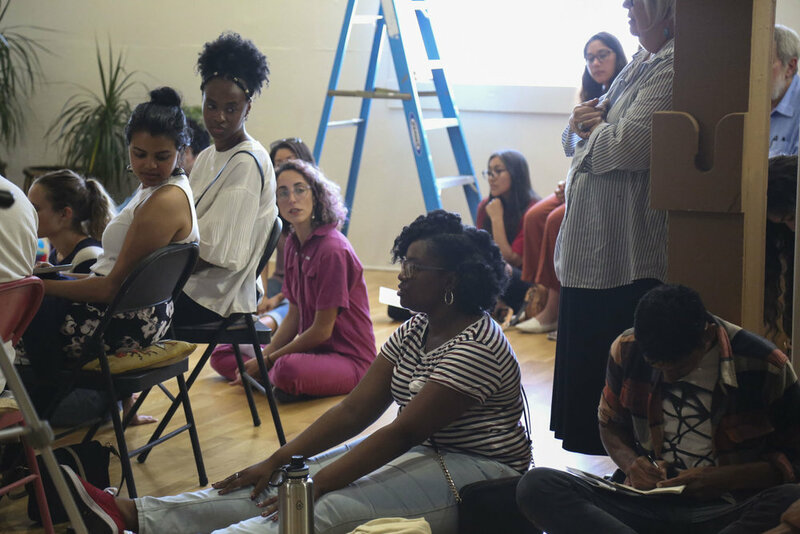 Our contribution to Moving the Map is a selection of works-in-progress by participants of Rhizomatic Studio’s 2018 Performance Lab, a forum for developing new performance works through the exchange of guided peer feedback over 8-weeks. The creative wing of my company Rhizomatic Arts, Rhizomatic Studio encourages the cultivation of artistic relationships while engaging dialogue across discipline and aesthetic. 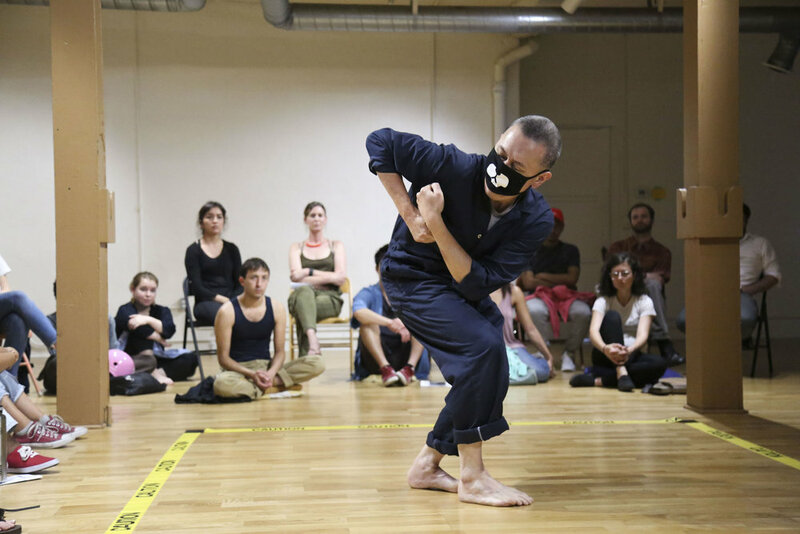 As an interdisciplinary community of peers, four artists working in different movement-based disciplines (dance, performance art, mime, physical theater) have agreed to support one another to make the best work possible. 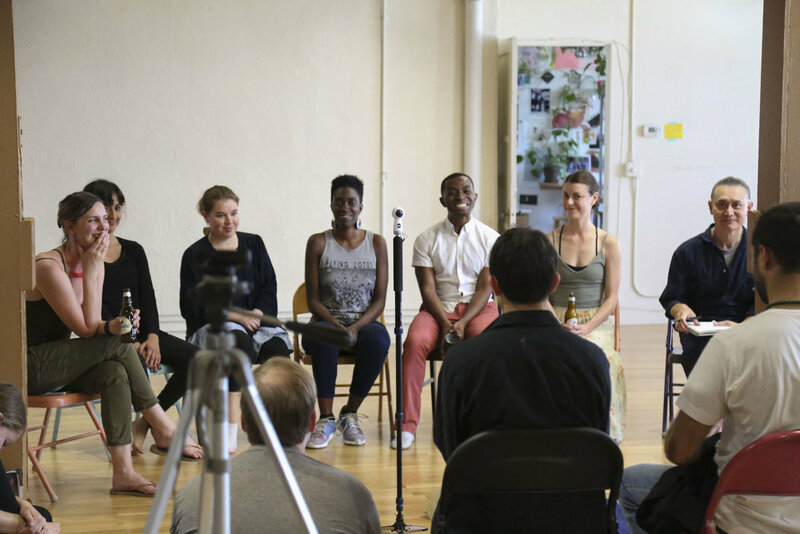 At our 3-hour sessions together, each artist presented up to 10-minutes of material for feedback from the group. I facilitated feedback using Liz Lerman's Critical Response Process, guiding the artists toward providing valuable perspective on the work presented, without “directing." I love this method because it allows us to very quickly establish a safe space for highly specific and generative feedback. Unlike some critique experiences, this method gives the artist ultimate agency and authority over their work. It can be hard to get used to at first (as the structure is quite specific), but ultimately it reveals a lot about our own aesthetics and biases, and makes us better listeners and watchers. I was thrilled with how this group of four artists clicked into the feedback method. Their insights were thoughtful, generous, and generative. Below are the artists’ words describing the works they will present on June 24th at Pieter in Los Angeles, and online. The performances will be followed by a moderated discussion with the audience, employing the Critical Response Process. As a first generation Haitian-American, I am constantly traversing the inter and outer spaces of the African Diaspora, such that throughout my life I have often felt like an alien from another world. As a multimedia musician and performance artist working in the Afro-futurist feminist tradition, my work grapples with the themes of displacement, otherness, and otherworldliness drawn from these life experiences. 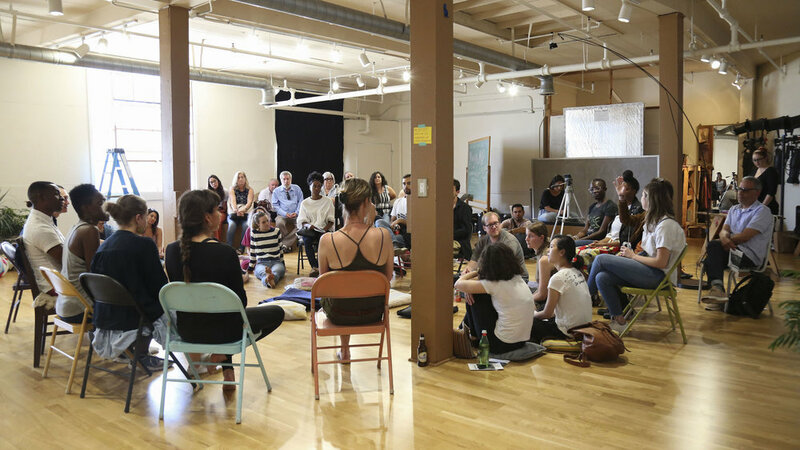 By the same token, my own alienation ultimately drives me to bring people together through the connective power of immersive and meditative performances. As an interdisciplinary artist, my extensive experience as a vocalist and composer compliment the inclusion of movement in my pieces. Currently, I am workshopping a movement from the Afrofuturistic opera that I am working on. SlowMotion is a culmination of years of performative work surrounding the aforementioned themes. It's been an honor to work on this piece with Rhizomatic Arts. Este Es Un Sombrero centers around a woman remembering her mother through the objects that were left behind. 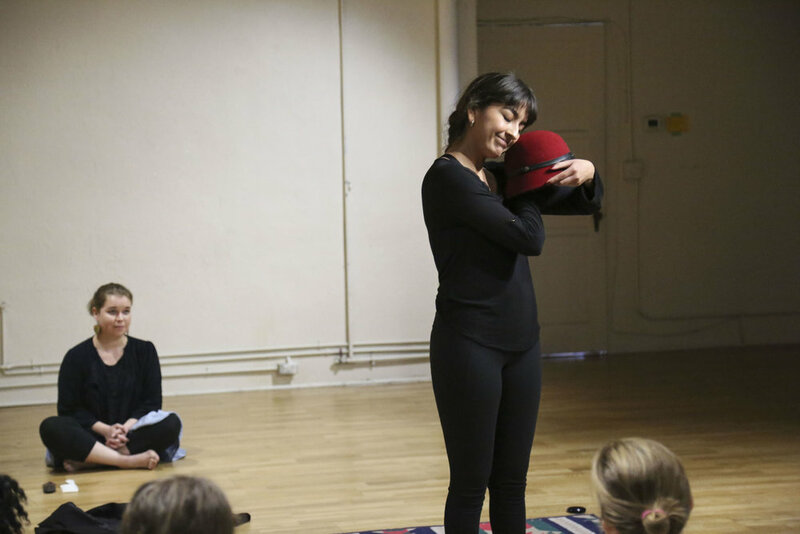 Utilizing movement and storytelling, Este Es Un Sombrero, tells the story of a family ripped apart by false “honor,” and how we use the things around us to cope, mourn, and remember the ones we have lost. Rhizomatic Studio has given me a platform to expand on my work in a way that I’ve never been able to do before. Receiving questions and constructive criticism from fellow artists has allowed me to approach my work from different perspectives, helping the piece grow in a way I couldn’t have done on my own. I'm a native of LA and have been working professionally in theatre on and off for the past 8 years. I have stage managed, done lighting design, performed, directed, assistant directed, and choreographed. I have a BA in Theatre from California State University, Los Angeles and an MFA in Physical Theatre from the Accademia Dell'Arte in Arezzo, Italy. I love physical theatre in its many forms. Performer Karen Arana is an LA native who is studying to receive her BA in Theatre Arts from California State University, Los Angeles. She enjoys creating and collaborating with others who seek to push personal/universal boundaries and learn from a myriad of people from different backgrounds. striking/light flirts with fantasy and examines desire. It is a solo work investigating the power of sexuality, on a quest to embody a desirous self. While I've come to cherish my solo practice, it can be insular and isolating at times. My experience in Rhizomatic Studio has left me stumped about my work! In a good and necessary way. Introducing new questions, perspectives, and insight after having shared a previous iteration of this work has been invaluable for thinking more critically and deeply about why I'm making what I'm making. I'm loving Liz Lerman's Critical Response method, Allison's facilitation, and the intimacy of a four artist residency. J. Alex Mathews is an arts practitioner with a background in performance, arts administration/consulting, production, and teaching. She earned a B.A. in World Arts and Culture/Dance from UCLA and maintains a creative practice comprised of performance art, dance, collage, and poetry. In 2017, she received an artist fellowship called Animating the Archives: the Woman's Building and presented original work at Avenue 50 Studio, Electric Lodge, and MiModa Studio. She was also granted a 2-week independent artist residency at Banff Centre for Arts and Creativity. Since January 2018, she has presented work-in-progress at Downtown Dance & Movement, premiered solo work at Highways Performance Space, and soon, at Pieter Performance Space for Moving the Map: The Dancer-Citizen Live. This fall, she is moving to Brooklyn, NY to pursue an MFA in Performance and Performance Studies at Pratt Institute. This piece is an invitation to make friends with uncertainty through an exploration of human falling and failing. Striving for order, and to feel safe and in equilibrium, it is possible and easy to fall into the extremes of inflexibility, isolation, and stasis, but it is also possible in the same moment to embrace uncertainty as opportunity. 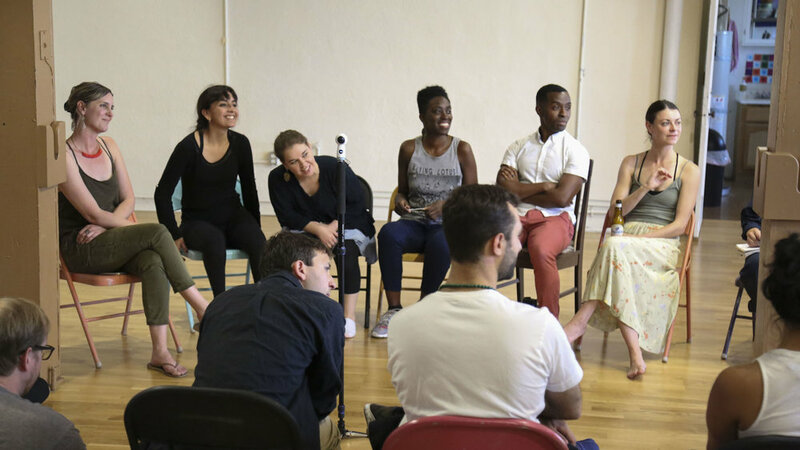 In the same way, Liz Lerman's Critical Response Process, facilitated by Allison Wyper in this Performance Lab, has enabled me to ask better questions about this piece, my compositional process, and even how I see what I do. It is invigorating to receive my colleagues questions each session in response to what they see in my work, and equally revealing to formulate my questions about their work. I wish I could do this all the time! I make work with movement, balance, and spatial awareness as a way to think about belonging, as a way to see others better, and to change how I move in the world. My interest in movement and the inseparability of mind and body comes to me through training in mime in the techniques of Marcel Marceau and corporeal mime of Etienne Decroux. My teachers are Christina Sergeant in Singapore and Thomas Leabhart in Claremont, California. 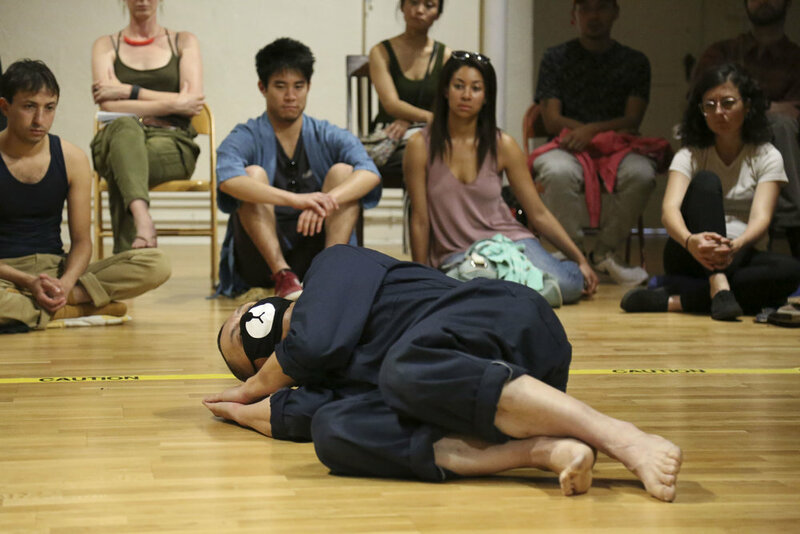 I am also indebted to the concepts and forms of Suzuki voice and actor training and Viewpoints improvisation as practiced by Anne Bogart and the SITI Company. My performance and installation art work explores mindfulness and attention, my own as well as the audience's/viewer's. In all my work, I look for ways to create shifts of perspective through attention to how we move and where we are.